These adjustable front sway bar links for BMW allow for the removal of preload on the front sway bar for models that utilize strut-mounted stabilizer links. The opposing thread patterns on these links allow them to be quickly and easily adjusted while installed on the car. Fine-tuning your front sway bar setup requires the ability to adjust your sway bar links which cannot be done with the factory end links. Set of two. Adjustable Front Sway Bar Stabilizer Links – BMW F80 M4, F82 M3. Our links include one-piece precision CNC’d stainless steel seat adapters. Unlike other links, our sway bar links come with plated, rust resistant threaded rods with high-quality, Teflon-lined race-spec rod ends and come complete with all necessary mounting hardware for an easy installation. 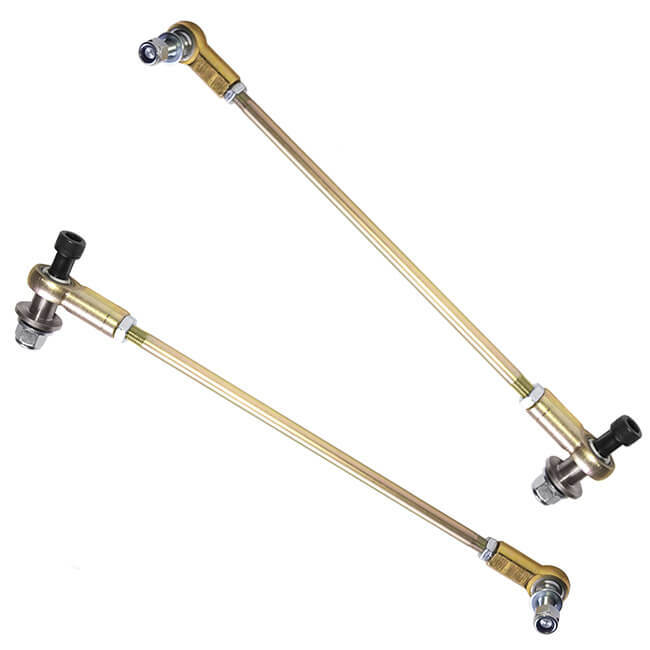 Buy: Adjustable Front Sway Bar Stabilizer Links – F80.